Try as it might, Polyphonal Digitial can't squeeze out any more power out of the PS3, which means that Gran Turismo 5 won't be quite as pretty as it had hoped. Polyphony Digital head Kaz Yamauchi has apologized to expectant Gran Turismo fans, saying that the game occasionally drops below 60 frames per second when the on-screen action becomes too hectic. He said that frame rate had been a major issue for the team, and it was working hard towards perfecting the game. Speaking to PSM3 Magazine, Yamauchi said that the Polyphony engineers were constantly complaining about having to try and achieve a sustained frame rate at a resolution of 1080p, but that he thought it was important to try and get the game as smooth as possible. He was adamant that the dips wouldn't be frequent, just when there was a lot of things going on at once. He gave the example of starting a race in 16th place while it was raining, and said that 15 other cars on-screen all at once, all kicking up sprays of water at the same time, meant that the game might not be running at 60 fps for a few moments. It's not clear whether the frame rate issues caused the game's most recent delay. Yamauchi's comment about perfecting the game suggests that Polyphony needed more time, but some sources suggest that it was actually problems caused by Sony's insistence that the game use more up-to-date firmware that caused the game to miss its production window by a few days, which caused a knock on delay of a few weeks. Without knowing how far the game drops below sixty, it's hard to decide whether Yamauchi is apologizing over nothing or not. If the frame rate practically halves, then sure, that seems like something worth mentioning, but if it's just a couple of frames, I think most Gran Turismo fans will forgive him - if they even notice. 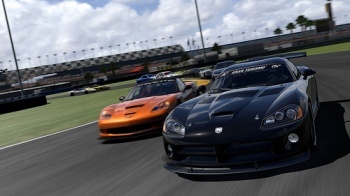 A new release date for Gran Turismo 5 has yet to be announced, but it should be some time this year.